Black Gold…OIL…the magic bullet of liquid petroleum not only propels all manner of people-movers globally, it’s also a component of more than 6,000 products everything from motorcycle helmets, to vitamin capsules, to ink. But who DISCOVERS these critical and elusive fossil fuels of oil & gas? MEET A WILDCATTER whose back-in-the-day journey from the hills of New York, to the ice fields of Alaska, to the plains of the Midwest brings the reader along on this complex quest to SEE underground. Here’s an insider’s look at the petroleum industry of the latter 20th century and what geologist Thomas E. Cochrane experienced along the way. From Oklahoma, to Texas, to rubbing elbows with iconic oilman T. Boone Pickens, his personal tales of the oil fields provide a firsthand glimpse into the art as well as the science of exploring and drilling all in the relentless pursuit of hitting the big one, every wildcatter’s dream. From company man, to making indie deals and partnering on the fly while chasing the next hot prospect, Cochrane discloses the technical processes involved in detail…but also the thrill of the hunt including what can sometimes go very wrong. From dry holes, to blowouts, to sketchy money men among a cast of other colorful oil patch characters, his story delivers a step-back-in-time look at a bygone era in an ever-evolving global industry… and he has a sage perspective to share on its future as well. 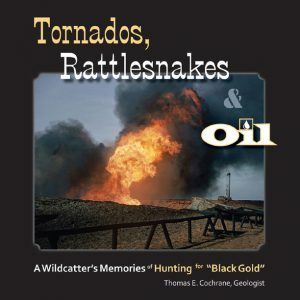 INCLUDES: over two dozen vintage B/W photos, charts & diagrams along with helpful sidebars to introduce the uninitiated to the science of hunting for oil. Note: Frankly, this is a man’s book with warts ‘n all tales of yesteryear and the author’s earlier [more sexist] attitudes are redeemed by the book’s conclusion when he candidly shares the key a-ha moments he subsequently experienced later in life, both personally and professionally.